HVAC equipment rental needs can arise year-round. 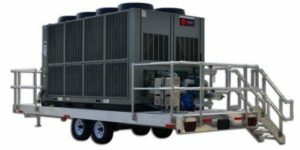 If you are in the market for a temporary cooling solution, contact Alpha Energy Solutions. We can help you find a system that is ideal for your project or urgent need. We specialize in projects of all sizes and have access to a broad selection of brands. Before selecting an HVAC equipment rental, there are a few points that you may want to review. The first step in choosing a rental system is to determine the specific application. Knowing ahead of time what you will need the equipment for will help to narrow down the vast selection that is available. In some circumstances rental equipment may be needed for an extended period of time while others may just call for a limited term. Regardless of how long of a time you will need the equipment, we can help you select the right unit. In the event of an emergency, we can support your demand as we are connected with a wide distributor network. If you are looking to invest in an HVAC equipment rental, you should think about the placement of your future unit. Systems will vary in size and capacity and you must have adequate space available to accommodate the unit. Finding the right location to place your unit may require taking measurements of the area and ensuring that proper connections are available. Based on your need, the type of capacity you require may also vary. Ensure that in addition to adequate space for placement that your system will not exhaust your existing power supply. Review the specifics at your location to determine how much energy is available for use. Also, keep your budget in mind when selecting a unit as its energy use may impact your overhead costs. Allow us to help you find an energy-efficient system. Once you have selected a system, we can support your unit with service. Our technicians are on-call 24/7 to handle service calls. Moreover, we offer preventative maintenance programs which can be customized to meet your system’s needs. Regardless of how long you will have your rental unit, keeping it up to date will ensure the best performance.